One of my favorite things about living in Costa Rica is escaping to somewhere new for the weekend. 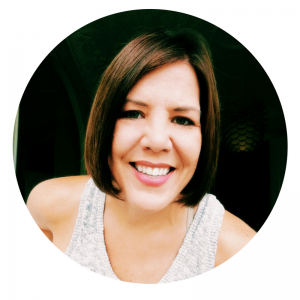 Living at the beach is great, but planning some weekend getaways to explore more of Costa Rica helps shake up things a bit. 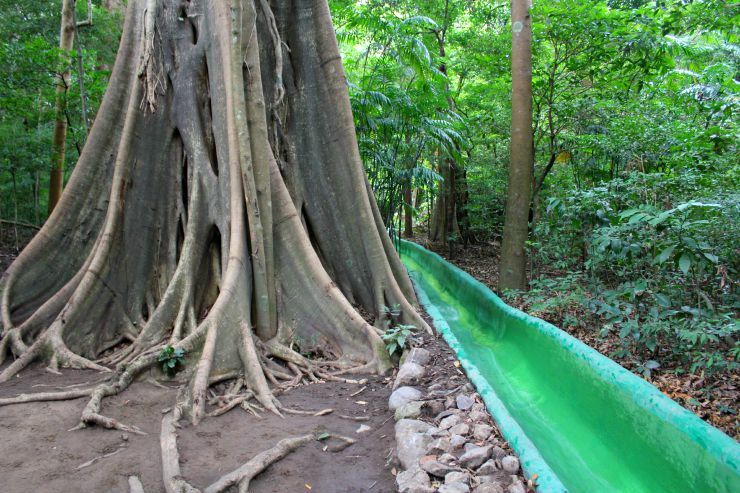 A few expat friends told us about the Buena Vista Lodge, which is home to the longest waterslide in Costa Rica, stretching 420 meters (1/4 of a mile). 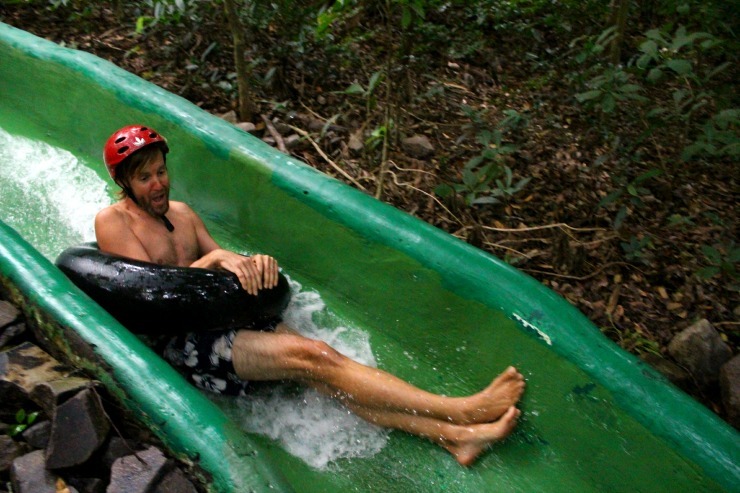 Clearly we needed to experience this waterslide for ourselves. 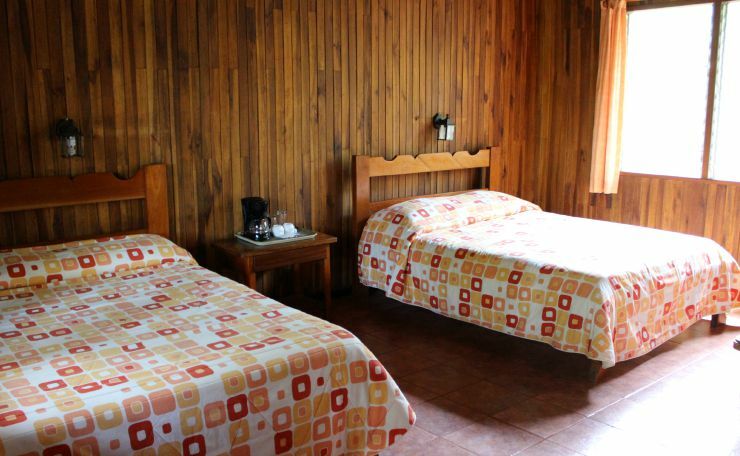 The Buena Vista Lodge sits in the foothills of the Rincon de la Vieja National Park, which is only about an hour drive north of the Liberia airport. However, plan on another thirty minutes on a bumpy dirt road to actually get to the lodge. Most places in Costa Rica worth getting to usually have a piece of challenging road, so be patient and you’ll get through it. 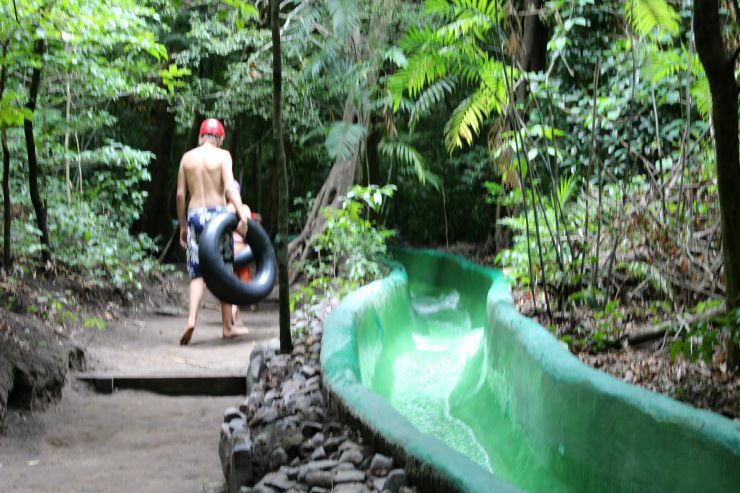 The Buena Vista Lodge is a one-stop-shop kind of place; you can do several typical Costa Rican activities and check them all off your list. 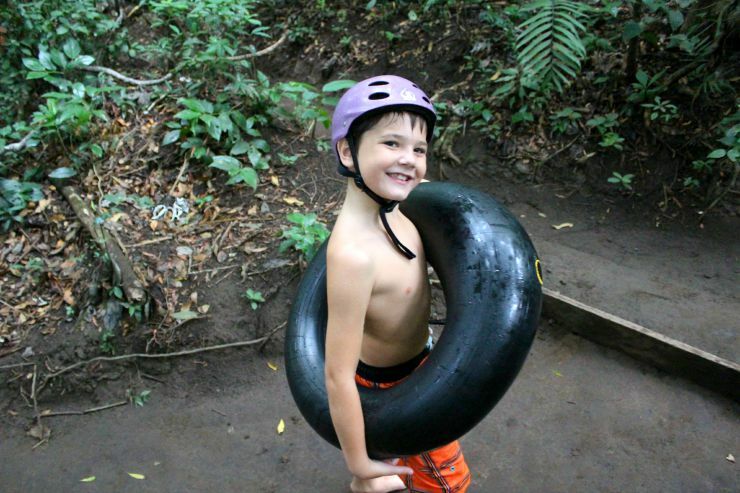 They offer hanging bridges, zip lining, horseback riding, hiking trails, hots springs and — of course — their famous jungle waterslide. If your time in Costa Rica is limited or you’re on a bit of a budget, this is the place for you. We dropped our stuff in our rooms right when we arrived and quickly changed into swimsuits to get to the hot springs before they closed for the day. 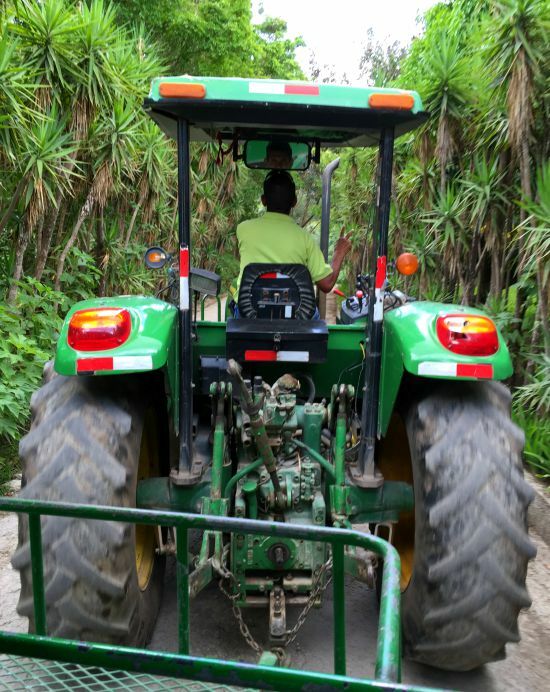 You can take a 30-minute nature hike down to the hot springs, or you can jump on the gigantic green tractor and get a ride. I wish the hot springs would have been closer and more convenient to the rooms, but the kids really appreciated the tractor ride, and on the way you”ll be able to take in some gorgeous mountain views. 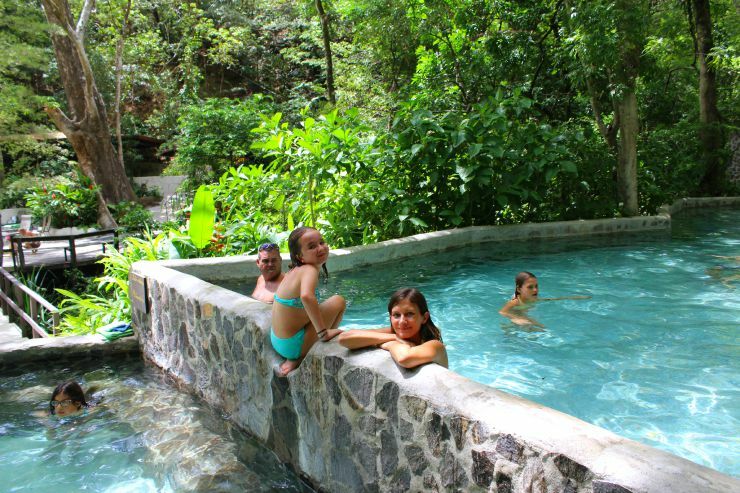 There are five hot spring pools, a sauna and a volcanic mud bath. 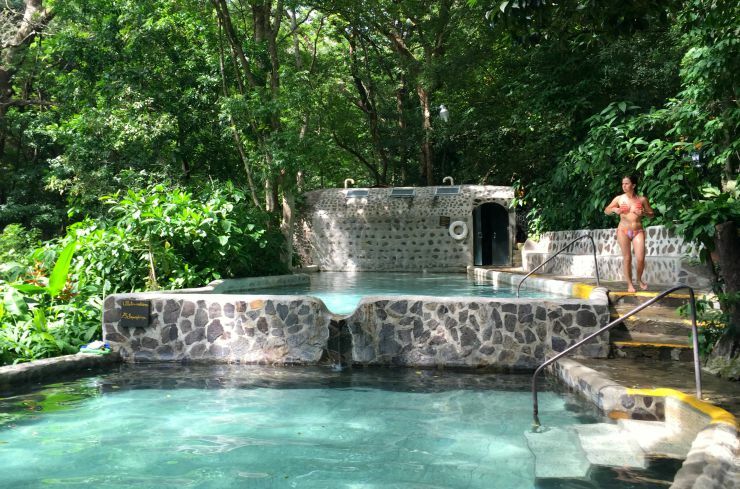 Mud baths in Costa Rica are not as luxurious or exotic as they might sound. It’s pretty much a large bowl of volcanic mud, and everyone just stands around slathering it all over their bodies — a pretty humorous scene. If you are not close with the people you are traveling with, it’s definitely a special bonding moment as you stand in the sun like statues letting the mud soak into your skin. Once the mud is dry there are showers to rinse, and a man will even spray the back of your legs with a hose for you. You feel a bit exposed and the water is cold so you’ll want to jump back into the hot springs as quickly as you can! You can use to store some of your things in lockers, and towels are provided for you. 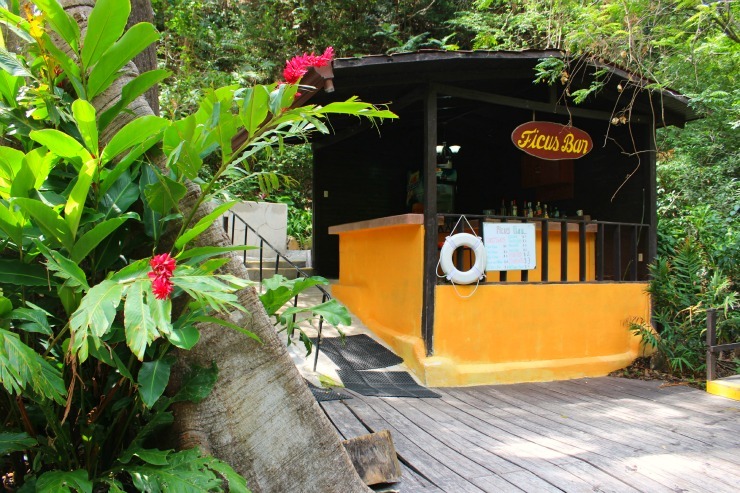 There is also a small bar to purchase soda, beer and a limited selection of alcoholic beverages — mostly rum. The accommodations are very basic: two beds and a bathroom, but for $70 a night I wasn’t really expecting anything fancy. Our room didn’t even have shampoo in the shower, and the bath towels were more like hand towels. I think the keyword here might be “rustic.” There are other rooms and cabin options, but we reserved our rooms late and were traveling with two other families. We literally got the last three rooms available. I did see some other cabins near the lake on the property that looked a bit larger and might come with a few more amenities, but you’d have to inquire about those. While the accommodations might have been a bit dull, we weren’t there for the rooms anyway. 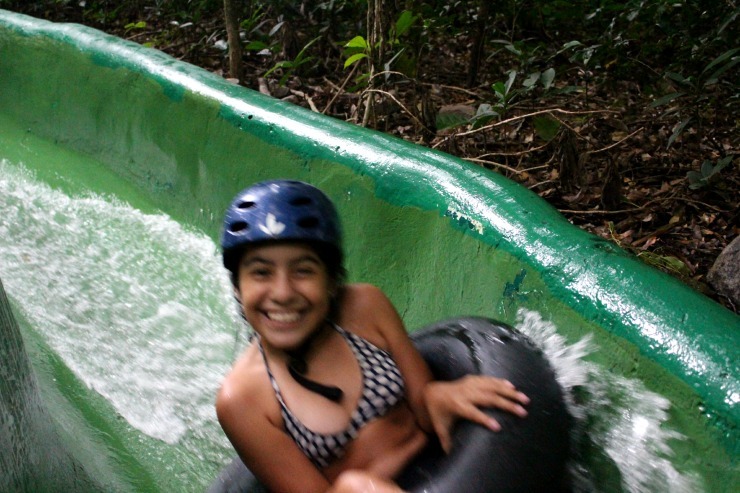 It was all about the jungle waterslide! 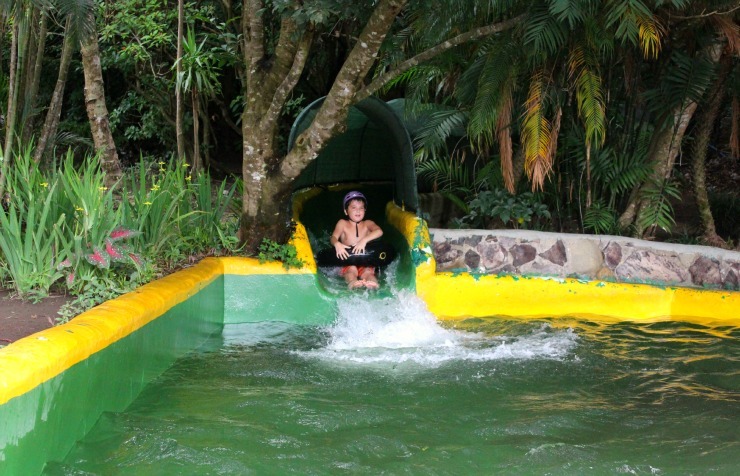 You will begin your jungle water slide adventure down at the small pool where you will plunge into at the end of your ride. You’ll be given your helmet and tube there; everyone must wear these to go down the water slide. Women and girls need to wear a pair of shorts over their swimsuit bottoms. I suggest bringing a pair of athletic shorts with you or you’ll have to wear these funky leather chaps that they provide. You can put your belongings on a few benches around the small pool, but there are no lockers so do not bring any valuables with you. If you have towels bring those as well, as they do not provide them for you. 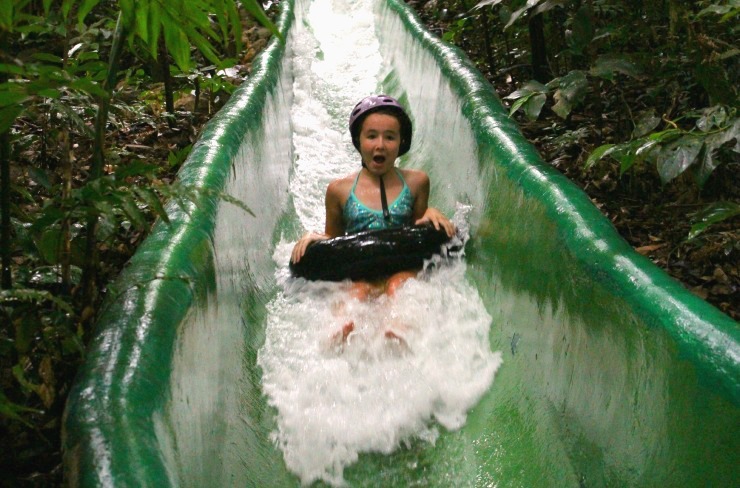 While you are meandering through the rainforest at a slight incline right next to the waterslide, you may think that it doesn’t look like much. Then you hear screaming in the distance before seeing someone zoom past you, with water rushing all around them! It’s faster than it looks. When you reach the top, you stand and wait your turn on a platform. 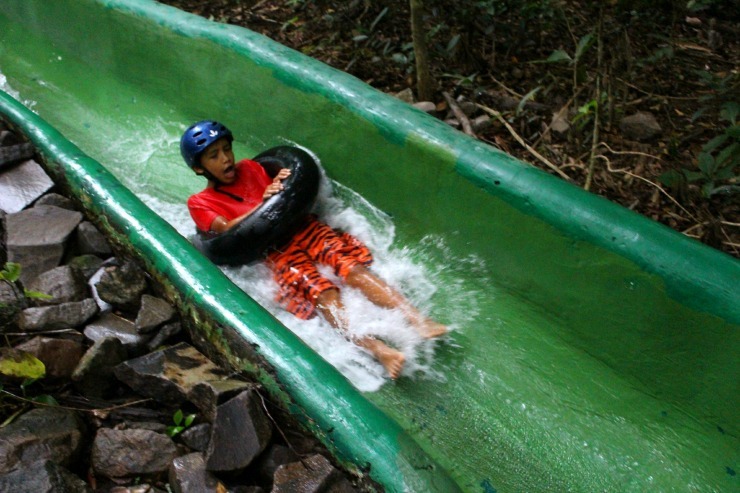 Once it is your turn, you will sit down on the slide and wait for the tank to fill up with water. There is a simple piece of wood holding the water back behind you. Then the man operating the slide pulls the rope to raise the wood door, causing a burst of water to push you forward and away you go! 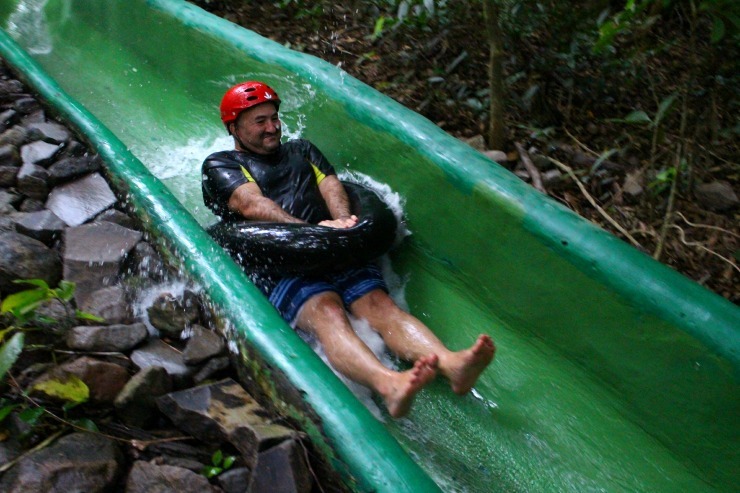 I have to say, this water slide was way more fun than I expected! The water was a bit cold, but it was all a part of the experience, from walking along the dirt path, sitting at the top in anticipation for the burst of water to hit your back and push you down, to the cold water splashing up in your face as you twisted down this narrow green slide. A thrill of a good time! Since I took all the pictures of everyone in our group coming down, I was able to witness the pure joy, excitement and fear on their faces – which was also very fun for me! It did take some convincing for the smaller kids to go down, they were a bit scared once they saw that the rushing water is what pushes you in the beginning, but once they overcame their fear they couldn’t stop running up the trail to do it again and again. Buena Vista Lodge Hanging Bridges aNd More! We did not do the zip lining course, but we did walk the hanging bridges. 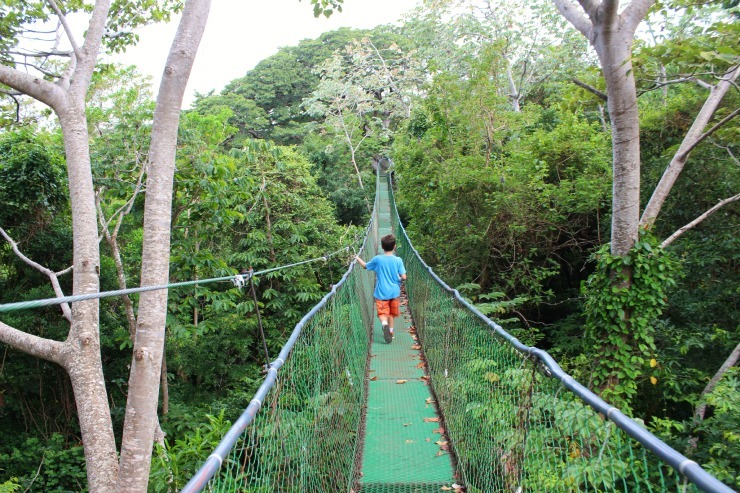 The hanging bridge course was the perfect length and height for all of the kids in our group — ages 7-12 — but younger kids can easily walk this course as well. The Buena Vista Lodge also has a large pool separate from the hot springs and water slide. You can enjoy horseback riding on their ranch, as well. The main restaurant food is typical Costa Rican food, served cafeteria style. You’ll find fish, chicken, rice, beans, plantains, fruit and some side salads. If you’re looking for other options, there are two additional restaurants on the property where you can order from a menu with more options. We did eat at one of them, and found your typical American fair of hamburgers, chicken sandwiches and french fries. The food was fine, but not extremely exciting. Overall, we had a great time and the water slide was well worth the visit. We stayed for two nights, and I really don’t think you need to stay anymore than that. If you are really pressed for time, you could enjoy what the Lodge has to offer in one night. You can also visit the Buena Vista Lodge for the day through a tour company or if you are staying at another hotel in the area. They sell day passes and individual tickets for all of the activities, so you could just visit for the day and continue onto your next destination. Disclosure: This was not a press trip and no discount was given to me for my stay. Wow, 420 meters is really long (I can imagine that since that is roughly the distance of the dirt road I have to take to get to my fruit orchard)! How long does it take for one to completer the ride?